The Greatest Movie Soundtrack Ever? I would have to agree. I bought the Conan the Barbarian 1982 soundtrack on album about a year or two after the movie came out. I love epic soundtrack music. In my car, I have my cds of Joy Division, Siouxsie and the Banshees, Julian Cope, and Echo and the Bunnymen. 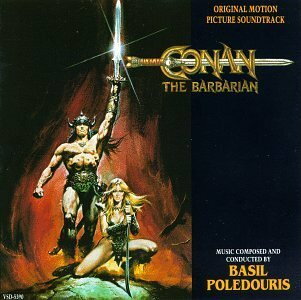 I also have various soundtracks such as Prokofiev’s Alexander Nevsky and Basil Polidouris’ Conan the Barbarian. The 1982 Conan movie is a mixed bag for me. It is not especially Robert E. Howard with the slave turning the big wheel. John Milius strip-mined some scenes from Conan stories in the service of making his movie. Conan the Barbarian has always struck me as a vehicle for Milius to make an homage to Akira Kurosawa. I call Arnold Schwarzenegger “Chip Rommel” as he goes through the movie with a generally befuddled look on his face. But, this movie is very important to fans that are now in their mid-40s. They were around twelve when this movie came out and it had a profound impact on them. Some pine for the day Chip Rommel returns as an aging King Conan. There are some classic John Milius’ lines of dialogue such as “Time enough for the earth in the grave” or “Crom, I have never prayed to you” that help elevate the movie from contemporary sword and sorcery movies of the time. To me, the greatest thing about the movie is the soundtrack. There is a story that Polidouris was to create something on the lines of Prokofiev’s Alexander Nevsky. In fact, on You Tube there is a movie trailer for Conan the Barbarian using Prokofiev’s music. The songs all have distinct melodies. A big epic feel is present. I played the soundtrack last year in my car when driving to the airport for the trip to Ireland for the 1,000 year anniversary of the Battle of Clontarf. There are times when driving home when I am not in the mood for hearing Pink Floyd or Led Zeppelin on the classic rock stations. I play the soundtrack for Conan the Barbarian. Basil Polidouris never seemed to catch lightning twice. The soundtrack to Conan the Destroyer just does not have the epic feel. The sound is tinnier. His other soundtracks are fine but for me never reached the pinnacle of Conan the Barbarian. I would love to add music to the Italian sword & sandal movies from the early 60s to my soundtrack collection. Someone needs to do a multi-cd collection from the historical epics and Italian muscle man movies of that era. It is good music to have in the background when writing also. Excellent recommendation. I think I’ve found a new workout soundtrack! I also love this score by Basil Poledouris. I highly recommend his score to the movie Flesh + Blood which is a gritty film taking place in Europe duing the middle ages. I, too, am a fan of epic movie soundtracks and probably have a gazillion +1 in my collection. Poledouris’s score for C the B might, or might not be the greatest soundtrack ever, but it’s an excellent choice — the best parts of the otherwise forgettable score to Conan the Destroyer were those cribbed from this one. I’d recommend BP’s score for the “Lonesome Dove” mini-series, as well — epic, yet elegiac, as befitted the subject. Also, it’s good to encounter another Chip Rommel fan. I don’t know if CtB really is the greatest movie soundtrack ever, but its certainly one of my absolute favourites. To my taste the only score that equals it is Raiders of the Lost Ark. Could easily listen to either on a perpetual loop. I think the reason it works so well is that it is a complete symphonic entity in its own right. You could set it to an adaptation of Gemmell’s LEGEND or the Kane stories and it would fit equally successfully. Most soundtrack albums act as short-cuts in the memory to specific scenes in the films, but there are precious few scenes in CtB that I ever want to be reminded of. The joy of the Poledouris score is that it evokes far grander imagery than any it was written to accompany. Polidouris’s score for “The Hunt for Red October” is another masterpiece, IMO. I’ve never heard another movie soundtrack even remotely like it. Guys, guys; can we all at least agree to spell the poor sod’s name the same way? Profound impact is a good description. I was around 8 when it came out and it is still considered one of my favorite movies. I first saw the movie at my grandparents drive in theater when I was 6. Have seen it well over 1000 times since. Best movie ever. I love the music, poledouris was a master at seamlessly putting this soundtrack together. Get the recent refab of the entire soundtrack played on the pipe organ. It’s awesome, not gonna lie, tears came to my eyes when I first heard it!